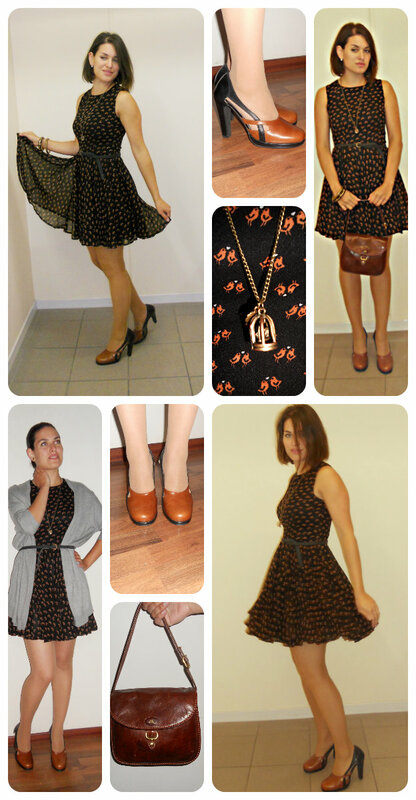 This time something really simple - the birdie dress from Primark! It is has great flattering cut with that kind of skirt you just want to turn around again and again to let it whirl around you. But this time let me speak more about the accessories - namely the bag. The Bridge bag. To be honest I had no idea about the brand, when I picked it up at the flea market. I just liked its colour, shape and the nice thick leather it is made of. If I remember well, the seller wanted 8 EUR for it, but after a while of bargaining I got it for 4,50 EUR. I think it is good price for the leather bag. But how surprised I was when, few months later, I googled the name written on the bag and I found out it is high quality Italian brand and the prices of their handbags start somewhere around 250 EUR! I was so happy when I found it out, because it felt like finding a treasure. For 4,5 EUR. IT has one scratch, but it is not much see-able If you want you can check the pictures of other bags here. Do you have some similar findings? How to Wear an Oversized Shirt?